Stevensville, MD – Miltec UV, 146 Log Canoe Circle (www.miltec.com) partnered with the University of Maryland QUEST Capstone Consulting Project this past fall. Quality Enhancement Systems and Teams (QUEST) is a multidisciplinary engineering, technology, and management program at the University of Maryland, College Park. Honors students from the A. James Clark School of Engineering, College of Computer, Mathematical, & Natural Sciences and the Robert H. Smith School of Business participate in a challenging course of study that focuses on quality management, process improvement, and system design. The QV Consulting team consisted of five individuals: Catie Den, Accounting, Jill Gelinas, Supply Chain, Government & Politics, Liam Mercer, Finance, Operations, & Business Analytics, DJ Sharma, Computer Science, and Noah Vernick, Mechanical Engineering. 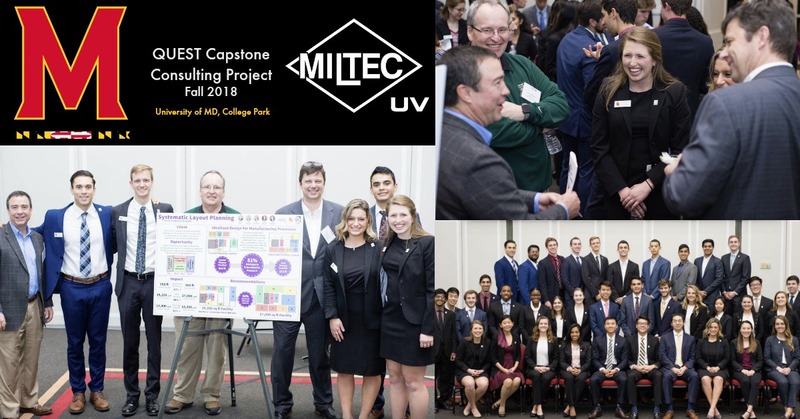 The distinguished students analyzed Miltec UV’s current manufacturing processes and spaces in order to create an idealized design for the next 25 years. The goal was to optimize the flow of people and materials and recommend ways to reduce waste in their processes. These diversified students created manufacturing maps and flow charts to demonstrate efficient opportunities available through layout planning, restraint understanding, and projected production growth. The team completed their project by introducing ways to minimize distances traveled between various manufacturing areas, maximize flexible growth space, and advance production.“The program has given us a new perspective on how to lay out our facility as our business continues to grow. It has helped us identify the relationship between our material flow and manufacturing processes. We are looking forward to incorporating these new ideas” stated Max Gallade, Manufacturing Engineer at Miltec UV. About Miltec UV: Miltec UV has been servicing the UV industry for 29 Years and is a global leader and manufacturer of both arc and microwave ultraviolet curing systems. Miltec offers a wide range of quality UV parts, standard equipment, and custom UV systems designed to interface with existing or new manufacturing production lines. These systems serve a broad diversity of industry-specific applications and market segments. Among the many applications supported are: optical fiber, metal decorating, hardwood flooring, luxury vinyl flooring, automotive products, as well as many other industries.